Sean is the Retail Sales Manager for Tailwaters Fly Fishing in Dallas. He grew up in Arlington and is a long time fly fisherman who spends most of his time pursuing the warm water species of North Texas. He cut his teeth fishing stock tanks for bass and panfish before he ventured into the salt. 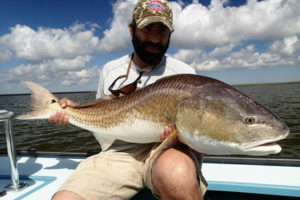 His favorite fish on the fly is redfish, with permit coming in a close second. Sean loves to travel and has been fortunate to fish across the U.S. as well Mexico, Belize and Bolivia as a host for Tailwaters Travel. Sean is also an avid fly tyer who specializes in bass and saltwater patterns. See you at the meeting at the UNT Health Science Center at 7 p.m.!